Loggia sliding panels are the ideal accessory to give your terrace covering a personal touch. They don't only ensure protection on the terrace against wind and sun but being equipped with tilting blades, they also create additional privacy. A number of new Loggia models will provide a suitable design for almost any style and every setting, whether you choose a complete wall in sliding panels or a ‘narrow passage’ in combination with wind-tight sun protection fabric. Loggialu Plano: Clean-cut and Transparent - This new alternative is equipped with rectangular, horizontal aluminium blades. 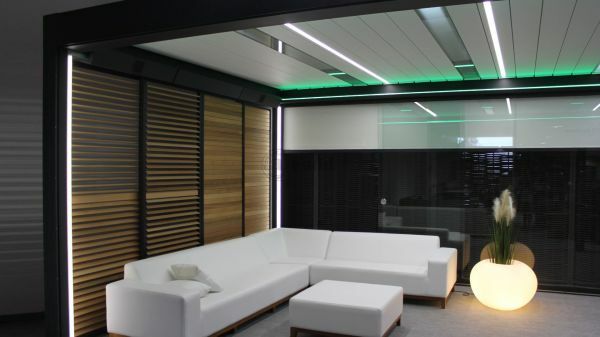 These sliding panels also have a distinctive, more streamlined design and easier look-through capability, whereas, because of the position and depth of the flat rectangular blades, they score just as well in terms of sun protection as their counterparts with slanted blades. 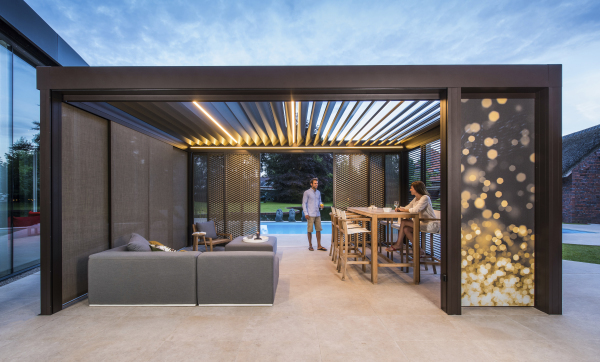 Loggiascreen Canvas: Skilful and Personal - Good news for those seeking a combination of sun protection fabric with sliding panels under their terrace covering. Finished with a screen, the aluminium frame of the Loggiascreen Canvas is barely visible. The result is a clean-cut and minimalistic ‘screen fabric’, which can also be customized and printed as required. Loggialu Stirata: Dreamy and Oriental -The new Stirata model of the Loggia sliding panels make you dream away and indulge in an oriental atmosphere instantly, while providing shade everywhere you desire. The infill of these panels are available in various models and gives your outdoor space an oriental or industrial look. You have the option of all possible RAL colours and can even choose different colours for the frame and infill. Loggiawood Linea: Natural and Romantic - In combination with the vertical rectangular cedar wooden blades, this model has a warm and sophisticated look. For lovers of a Mediterranean style, these are the ideal sliding panels providing additional shade while enjoying one's privacy. Looking at the panels from an angle, there is no look-through capability, whereas one can still look through when standing directly in front of them. Loggialu Wooddesign: Warm and Comfortable - The warm look of sliding panels with wooden blades is now also available in a durable aluminium model. It is comfortable because it barely requires any maintenance and there's no chance of ageing, whereas you still enjoy the natural look of wooden blades. The blades are available in 3 different wood prints; white oak, natural oak or walnut.